Stagecoach has accused Edinburgh City Council of "killing off" plans for a Forth hovercraft service by refusing planning permission for the project. The council's planning committee rejected Stagecoach's application for hovercraft landing and passenger facilities at Portobello. It comes only weeks after Fife Council gave permission for similar construction work at Kirkcaldy. Edinburgh City Council has taken two years to vote on the application. Stagecoach said the planning application was first submitted in December 2009 after a series of consultation meetings with communities on both sides of the Forth. Following a site visit last month, Edinburgh councillors refused planning permission at a committee meeting earlier, despite approval being recommended by officials. It is understood councillors cited the visual impact of the proposed ramp, noise and transport concerns for their decision. Stagecoach has worked on ideas for a sea-based crossing between Fife and Edinburgh for more than a decade, arguing that it offers a faster and greener alternative to car travel across the Forth Road Bridge, one of the most congested routes in Scotland. 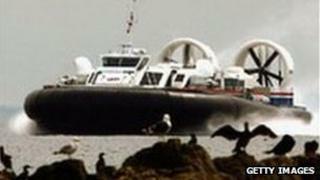 A Stagecoach spokesman said the council had "killed off" the hovercraft with its "short-sighted" decision. He added: "The hovercraft would have given the east of Scotland a high quality transport link that people could be proud of and one that had the potential to boost the economy and local communities. "Instead the council has stifled innovation and again sent the wrong signal over public transport on the back of the Edinburgh trams fiasco." Stagecoach Group chief executive Sir Brian Souter said: "This has been a long and painful process. We are completely scunnered and have no intention of appealing against the planning decision." The hovercraft journey time was 20 minutes. Russell Imrie, chairman of transport partnership Sestran, said: "The Forth can and should be viewed as a thoroughfare, not as an obstacle, and Sestran is committed to developing options that will enable the estuary to play a key role in the development of a sustainable transportation system for the region. "Sestran provided significant financial backing for the hovercraft trial project in 2007 and this was an unqualified success." An Edinburgh Council spokeswoman said: "At the planning committee on Wednesday, councillors rejected the application for the Forth hovercraft crossing." Individual councillors on the Kirkcaldy Area Committee, which recently gave the project the green light, have voiced their dismay at the council's decision. Committee chair, Councillor Alice Soper, said: "I'm pretty disappointed and I'm pretty sure most of the general public will be as well. "I was on a trial journey and it was wonderful - 17 minutes to get across the Forth. It would be nice if they'd reconsider." Councillor George Kay, who represents the Burntisland, Kinghorn and West Kirkcaldy ward, also issued a plea for Edinburgh Council to think again. He said: "I'm absolutely devastated about the decision taken by Edinburgh Council. I feel it's short-termism. "I would hope that even at this stage they may be able to find a way to review their decision." Tony Martin, chair of Fife Council's environment, enterprise and transport committee, said it was "disappointing" that Stagecoach had decided not to appeal against the decision.